Jurong Central Citizens' Consultative Committee, in co-operation with Loving Heart, the schools and other civic partners distributed hampers and gifts to needy residents in the five RC Zones. The event was held on 2nd and 3rd February 2013, in conjunction with the Ministerial Community Visit, by Mr S. Iswaran, Minister (Prime Minister's Office) and Second Minister for Home Affairs & Trade and Industry. Students from Hwa Chong Institution (College Section) organized a one day learning trip for children from low income families as part of their Service Learning Project. This trip intends to gain new learning and knowledge through the place of interest which is the visit to National Museum. The group chose to visit educational places such as the museum as this help the children to learn more about Singapore’s culture and society better. A total of 19 students from our Free Tuition Programme attended the visit on 20 April 2013. A briefing was held with ice-breaker games before the journey to the museum, the children are given a worksheet to encourage learning and participation during the museum visit. 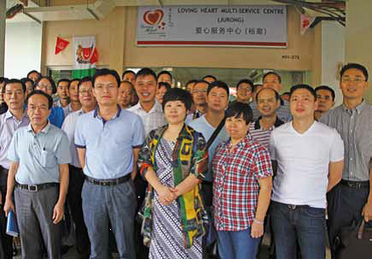 Delegates from Suzhou and Foshan visited Loving Heart Centre on 16 July and 11 September 2013 respectively. ​ The visitors, who were on an exchange programme with National Community Leadership Institute (NACLI), learned more about our organisation, programmes and events. They participated actively in the dialogue session thereafter. The visits concluded with a tour of the Youth Centre and the Loving Heart Cheng Hong Satellite Clinic facilities. Jurong Central Constituency organised The One Community Walk for residents on 25 August 2013. The event originated from the nation-wide mass walking event which engages the residents from all the constituencies in Singapore. ​ Hua Yi Secondary School sent 20 students to participate in the Walk. Loving Heart was selected as the adopted beneficiary. Guest-of-Honour Mr Ang Wei Neng, MP for Jurong GRC presented the donation of $1,000 from Jurong Central Citizens’ Consultative Committee to Loving Heart during the event. Yin Sheng Dian, a civic group, invited 800 elderly from various Volunteer Welfare Organisations (VWOs), homes and organisations for a lunch on 3 July 2013 at Sungei Tengah Road. Loving Heart was invited and brought 40 elderly for the lunch event. Another civic group, Jing Bao Tan invited 300 elderly from various VWOs, homes and organisations for a lunch on 26 July 2013 at Petir Road. The organisation provided wheelchair-friendly transportation so that the wheelchair-bound elderly could join in. The 90 elderly participants who attended from Loving Heart enjoyed the sumptuous lunch and were given red packets and food hamper gifts from the hosts. 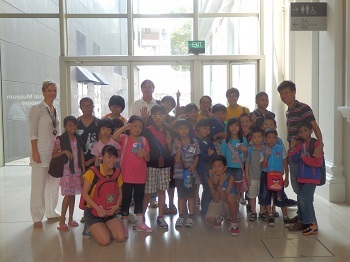 The Society of Tourist Guides Singapore (STG) organised an outing for 48 students of Grace Orchard School on 8 December 2013, with Loving Heart as the coordinator, accompanied by eight caregivers and 22 STG guides. The outing was fully sponsored by STG, including the attraction entrance fees, snacks from Panda Pau and lunch. The guides showed the students around the attraction and took time to patiently explain various exhibits to them. One of the volunteer, who is a professional caricaturist, thrilled the students with his drawings of them. An informal group of Republic of Singapore Navy officers; known as Friends In Charity, organised the event at Bukit Timah Community Club on 24 August 2013. The event was attended by 200 children and youths, aged between 7 to 17 years old, from 10 welfare organisations including Loving Heart. The participants designed their team flag at the start, and pitted their skills and wits in various team-relay games put together by the volunteers. The aim of the event was to educate the children on teamwork through the interaction. Transport, lunch and game prizes were sponsored by Friends In Charity. Makino Asia Private Limited, Loving Heart’s Corporate Sponsor, organised a sumptuous lunch for the Bukit Batok Home for the Aged at its headquarters office on 5th September 2013. Held in conjunction with Makino’s 40th Anniversary celebration, highlights of the fun-filled event included a cake-cutting session and the presentation of gift bags to the elderly by the Guest-of-Honour Mr Desmond Lee. Other memorable moments included a quiz on Singapore landmark, karaoke entertainment by Makino staff members and an Indian dance and dikir barat performance by students of Global Indian International School and Muhammadiyah Welfare Home. Singapore Institute of Management, University of London’s Student Representative Council (UOL-SRC) invited Loving Heart Free Tuition programme students to a Christmas Party on 28th December 2013 at *SCAPE. Some 22 students participated in the outing, where they played group games, were presented with goodie bags and treated to a buffet lunch. ​Parc Oasis Condominium Neighbourhood Committee organised an outing to the S.E.A. Aquarium for our Free Tuition programme students, as part of their Parc Oasis Project Sunshine on 16th November 2013. A total of 20 students attended the outing with the residents, received goodie bags and food vouchers. E-Waves FishByte "Reeling Heart Together"
Residents from Case Management were invited to an outdoor fishing event, organised and sponsored by E-Waves FishByte. The event was held on 1 June 2013 at the Nanyang Lake, within the campus of Nanyang Technological University. The aim of the event was to encourage family bonding time. The participants were guided by the E-Waves FishByte’s volunteers on some practical knowledge of fishing. The fishing equipment and lunch were provided by E-Waves FishByte.